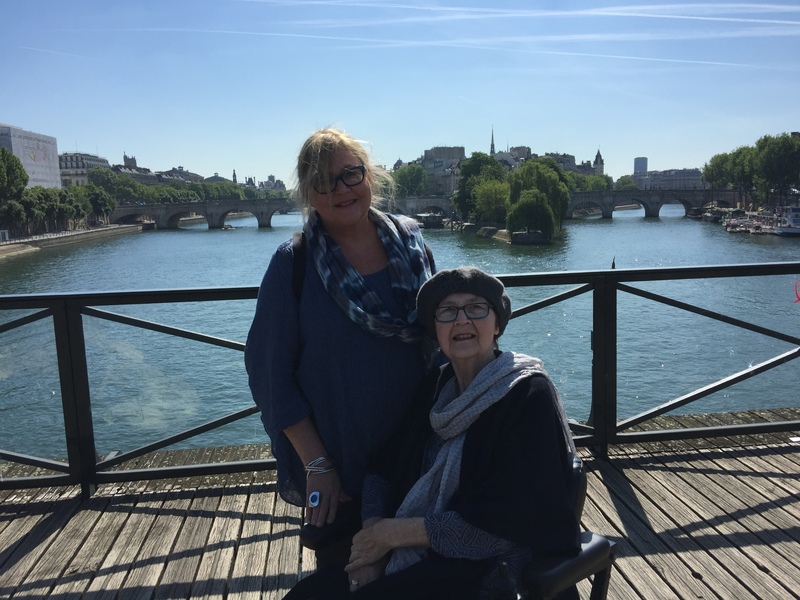 What do you do when you can’t find decent wheelchair accessible accommodation? That doesn’t look clinical like a hospital? Answer: build it from scratch! After 4 years operating 100 Hitchcock with awesome reviews, my favourite comment is “I had no idea 100 Hitchcock was wheelchair accessible!” Why? 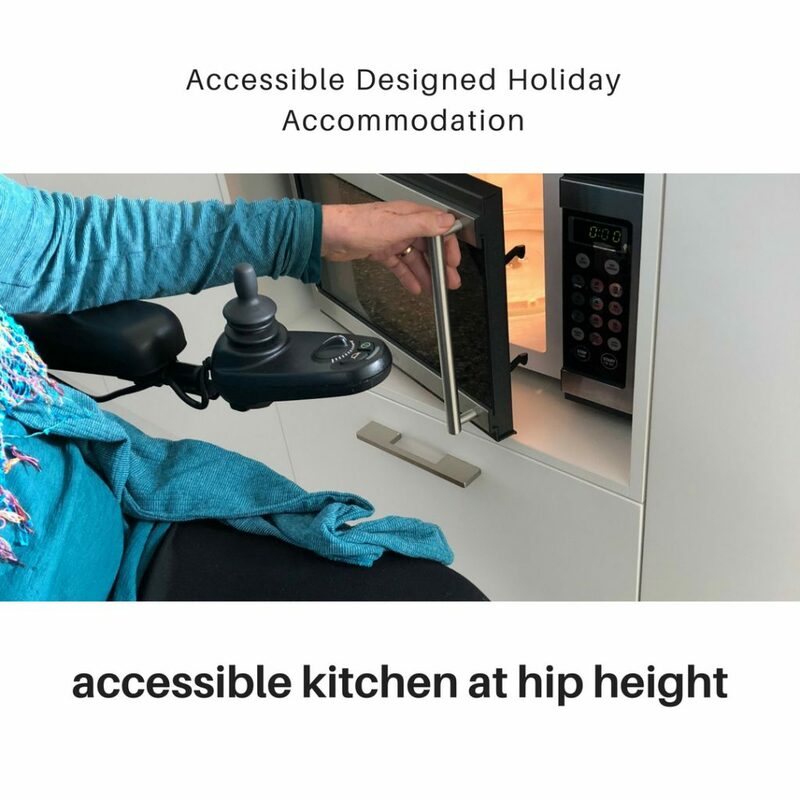 Just because you need a little extra help getting around, it does not mean your wheelchair accessible accommodation has to look like a hospital. The moment we started working with the Architect, our focus was to create a home that ANYONE can access. 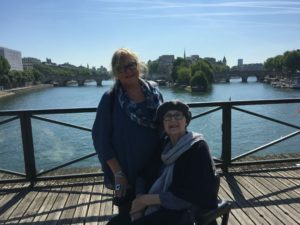 Four years later and the most frequent comments are “I didn’t even realise that 100 Hitchcock is wheelchair friendly.” I wanted my mum (or any guest needing a bit of extra help getting around) to feel like they were ensconced in a little luxury – not a clinical hospital. 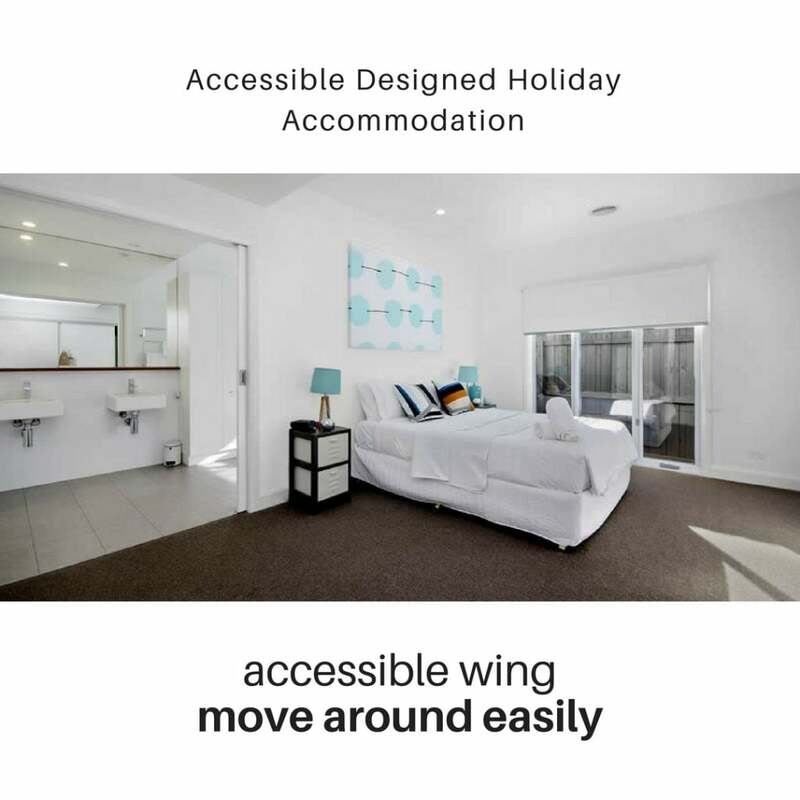 So we did heaps of research, studying how to achieve accessibility without compromising the look and feel of a regular luxury accommodation. If you are thinking of booking a holiday with us, check out our very detailed FAQ page here. We chose Barwon Heads primarily because of the lovely flat paths winding around the river, and into town. 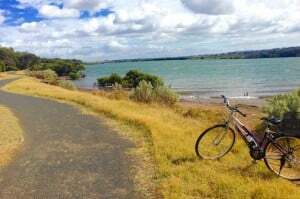 My mum is a hoon on her scooter and loves getting out and about Barwon Heads unassisted. Occasionally the footpaths can become a challenge so I can’t promise every footpath is perfectly level. 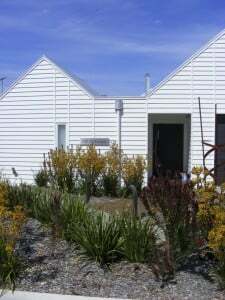 Ramp to the front door integrated into the landscaping. We found that some wheelchairs are easier to get through from the garage, which is completely level as there is a small bump at the door. The plants grew so quickly! Then came doorway access. How can we have wide doors that look great? Answer: custom built wide sliding doors throughout. Obvious to most, the home has to have completely level floors that are easy to glide over. 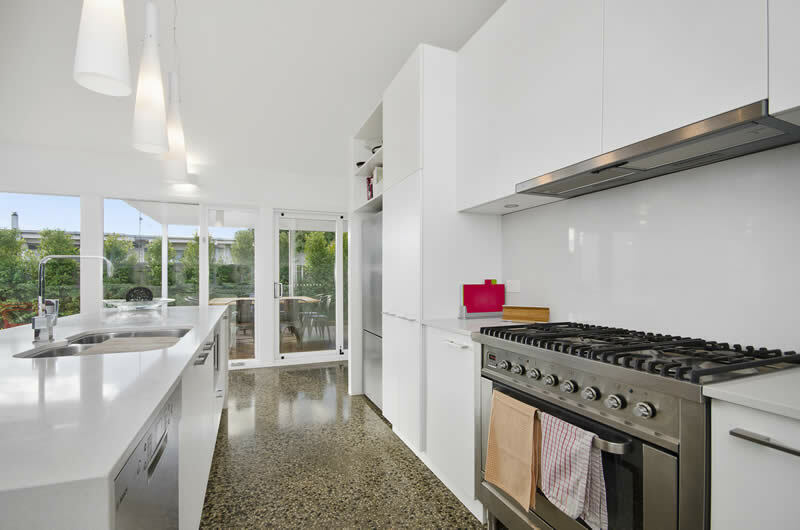 So we chose polished concrete. For the bedrooms, we chose an extra firm carpet. Next, possibly the most important consideration: the bathroom. The next consideration is the bathroom. 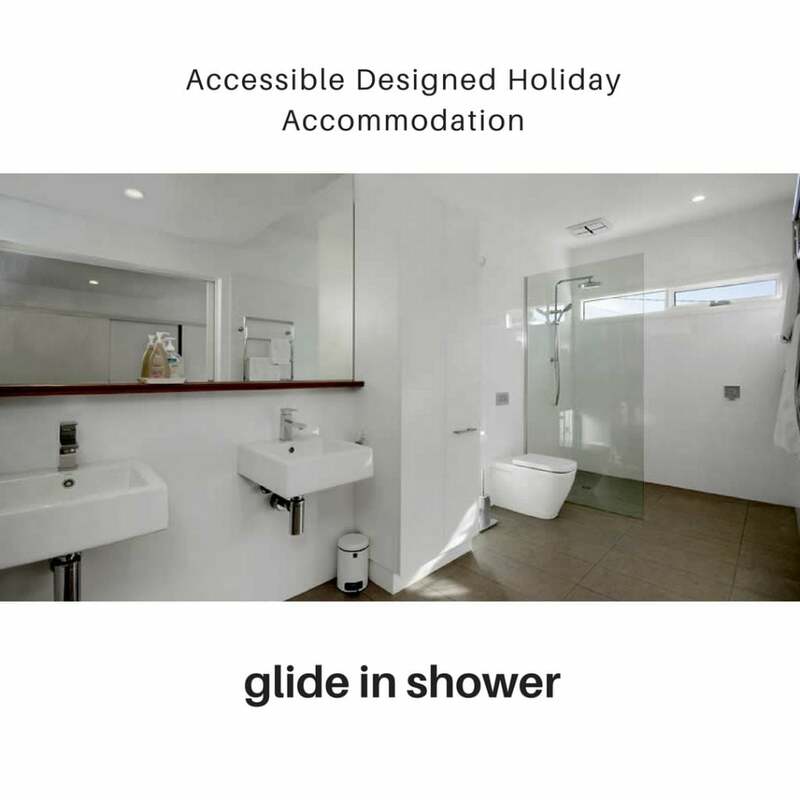 The en-suite required sinks that a wheelchair can slide under. A shower that is wide enough and free standing. 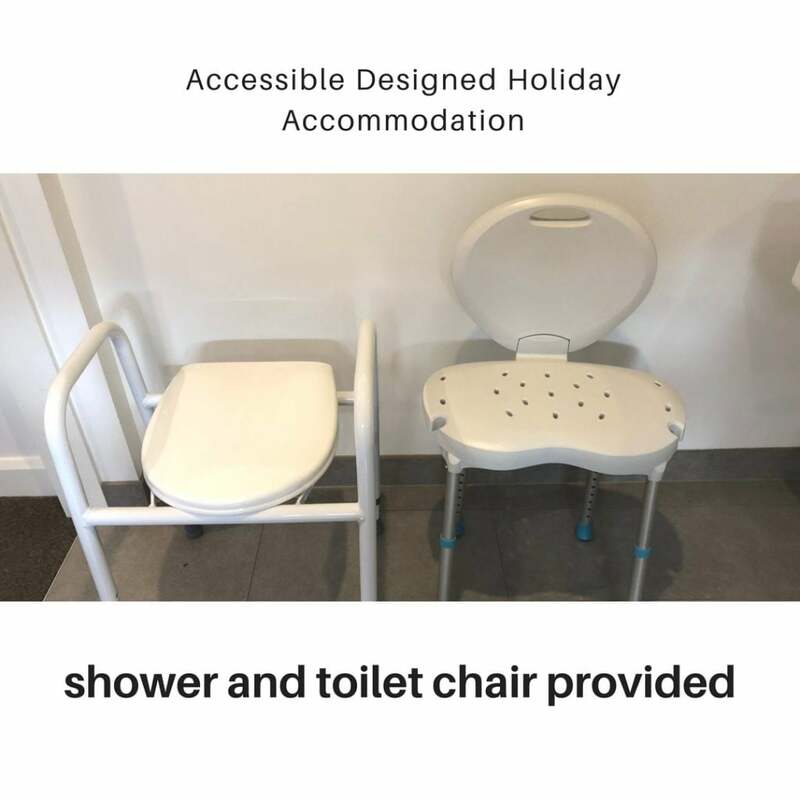 We have fold away shower chair and toilet seat. We chose detachable grab rails for two reasons. First, my mum can’t stand them. She says they look like a hospital. Secondly, detachable ones can be used for lefties and right-handed users. Guests not needing accessibility use the deep luxurious bath, and shower in the second living wing. For the kitchen, the microwave, refrigerator, oven, stove and dishwasher is at hip level. Not everything is all at hip level, but the essentials certainly are. We regularly post about activities that are suitable for disabled guests. Check out our other blogs such as Accessible Surfing and beach wheelchair hire as well as music festivals. I love having mum come and stay and be my test dummy for new products.